Technology has rocketed neuroscience forward since the middle of the 20th century. From probing single cells to recording from the entire brain at once, longstanding questions from the past can be answered with the turn of a few knobs and the push of a few buttons. None of the tools in neuroscience are more familiar, and perhaps more controversial, than that of functional magnetic resonance imaging (fMRI). Using blood flow as a surrogate for neural activity, fMRI combines liquid-helium cooled magnets, the atomic properties of water molecules, and advanced computing to paint a picture of how the brain is being used at any given time. Given the wealth of modern equipment that goes into fMRI, it’s amazing to find out that the ancestor to this technique first occurred in the late 1800’s. None of the ingredients were present at the time: this was before computers, before we knew the physical properties of atoms, even before we discovered helium. Despite the limitations of his time, the Italian father of neuroimaging Angelo Mosso set out to demonstrate that mere thought drew blood to the brain for energy. Although Mosso was known in his time and was even referenced by William James, he wrote exclusively in Italian and his works lay relatively dormant until retranslated and revisited earlier this year (Sandrone et al., 2013). Mosso began his foray into the world of cerebral blood flow where much of neuroscience got its start: in patients of unfortunate, head-related accidents. Mosso found that after experiencing cranial trauma, sometimes parts of the skull would slightly yield to blood being pumped with every heartbeat. By measuring the movement of the skull, he could see how much blood was going into the brain during each pulse. Remarkably, when he asked the patients to perform mental arithmetic, he saw the blood pressure with each heartbeat increase. This change in blood pressure was exclusive to the head and did not occur in a simultaneously recorded arm (Toga & Mazziotta, 2000). While studying uniquely injured patients has advanced progressed neuroscience, generalizations are more easily made by moving to normal subjects under controlled conditions. Therefore, Mosso sought to extend his studies by inventing a system to measure neural blood flow in average people. His answer to such a complicated question was remarkably simple. If blood shifts from the body to the head under certain conditions of mental effort, then the head would transiently weigh slightly more relative to resting periods. Following this theoretical principle, he built an apparatus consisting of a tilting table and counterweight system on which a person would lie (pictured left, Sandrone et al., 2013). Reminiscent of problems his neuroimaging descendants would face, Mosso had to deal with artifacts such as breathing and slight body and head movements. 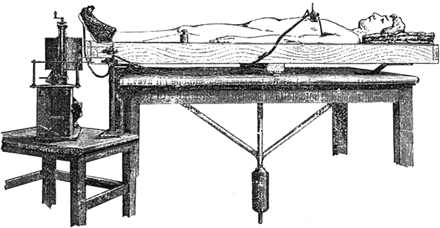 He also had to have sufficient controls for his measurements, making sure blood pressure wasn’t increasing in other areas of the body and that the table was steady during resting periods. On the other hand, unlike modern users of fMRI, he had to be a skilled carpenter and machinist to construct his own equipment. Once his experiments were prepared, he followed in the footsteps of many great neuroscientists and used his student and lab technician as his research subjects. Mosso did in fact claim to observe consistent table movement towards the head in response to auditory stimuli, reading, and being read emotional letters. Moreover, he measured a graded effect of blood flow where more mentally taxing stimuli resulted in a larger tilt. For instance, a small change resulted from hearing a clicking noise, and a large change accompanied reading a letter calling in an overpaid debt. Prescient of the current relationship between the media and neuroimaging research, one French newspaper thought his methods “would soon fully explain the physiology of the human brain and lead to new treatments for neurological and mental illnesses.” Indeed over a hundred years later, modern fMRI continues to be a main focus of neuroscience in popular news, and neuroimagers continue to watch the brain as it shuffles blood around to support our mental faculties. 2. Raichle, ME (2000). A Brief History of Human Functional Brain Mapping. In AW Toga, JC Mazziotta (Eds. ), Brain Mapping: The Systems (pp. 35-41). San Diego, CA: Academic Press.